What was the best birthday cake you ever had? On my 12th birthday I dreamed of my cake: rich in chocolate, light, melt in your mouth, the center piece of my birthday party. I never got it. I have always been particular about my birthday cakes, and my mother has always delivered. Growing up you could say I had an elaborate imagination. I once had a fish themed birthday party and I wanted my cake to be a fish tank. You can bet your bottom dollar that my mom made a chocolate cake decorated as one. On my 18th birthday I told my mom to get creative, actually I told her that I just wanted cannoli’s. She made a four layer chocolate cake with chocolate mousse icing, and cannoli filling between the layers. I still remember it today; the icing was so light, and so rich in chocolate with a hint of coffee flavor, and the cake, so moist, so light, paired perfectly with the sweet creamy cannoli filling with crunches of mini chocolate chips. It almost makes up for my twelfth birthday, almost. The best chocolate brownie ever! Twelve was a weird age for me, while I was playing out in the dirt and on the basketball court; all of my friends were growing up and becoming more girly. They all started to care about their hair, boys, lip gloss and being popular. I just cared if I could make ten foul shots in a row, or make the game winning goal in field hockey (some things never change). I was torn between brushing my long matted hair, or cutting it all off to a short pixy cut. Things were definitely changing. I made a big decision for my birthday that year, I wanted a big chocolate cake with pink icing (are you finding a pattern here with the chocolate). Pink. This was a big decision for me, normally I did purple, green, white, chocolate, chocolate with candy on top, never pink. My mother was slightly thrilled, I was finally embracing my girl side, maybe next I would start brushing my hair and wearing dresses (spoiler alert that did not come until college, the dress part at least). My mother agreed with the biggest smile on her face to make this the best cake ever. You know when your mother says something and you know she is being truthful, she says it with passion and the biggest smile on her face. 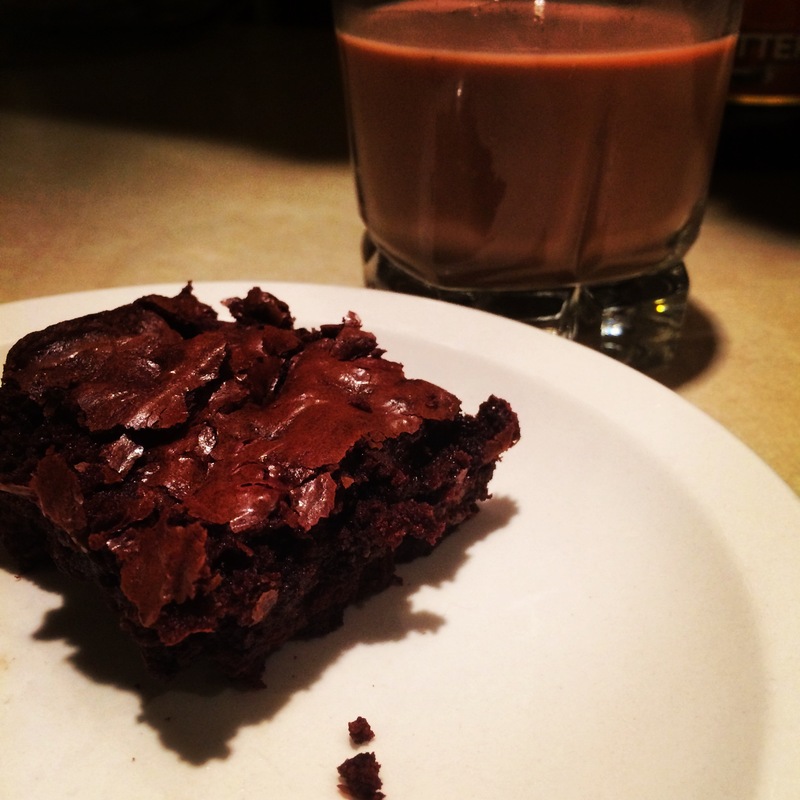 Chocolate milk with chocolate brownies… Can you ever have too much chocolate? My birthday was just like any other, I played outside all morning with my neighbor. Somewhere between racing dirt bikes and climbing the sappy evergreen trees I decided I had to come home to get ready for my party. As soon as I pulled the heavy sliding glass door open, I could tell something was not as it should be. Have you ever watched a show on TV where the evil genius has this crazy smirk on his face, it was kind of like that. My mother quickly ushered me out of the kitchen, assuring me that everything was fine and that company would be coming soon, I should shower. She was my mom, what else should little naive me believe? Let’s fast-forward through the party; it was great, family and friends everywhere, different pasta and potato salads sitting on paper plates with flies trying to land on them, all my uncles were drunk, you know typical children’s birthday party. Time for cake. I sat down at the big dining room table, feeling somewhat lost in the magnitude of the chair at the head of the table. There was no cake yet, this should have been my first warning sign. The singing began all upbeat and happy, I saw my mother bringing the cake tray from the kitchen to the dining room. Something was not right; I did not see a cake. There was no pink fluffy frosting, no cotton candy clouds of white, no rainbows bursting from the cake in magical glee, in fact there wasn’t even a cake. In front of me my mom dropped with a thud, a flat, heavy, uncooked version of a chocolate cake. No icing, no candles, no nothing. When the birthday song was over, which now sounded to me like a gaggle of drowning frogs, I did not know what to do. There were no candles to blow out, no wish to make, and no cake! My mom blurted out, “surprise, brownies instead!” everyone started laughing. Was it me they were laughing at, my misfortune, my flat, icingless cake? I brushed it off. I was 12, tough 12 year olds don’t cry. The cake was never cut, it was thrown out. We had cookies and ice cream instead. Apparently my mom was so busy with preparing everything else she forgot a few key ingredients in the cake. I never forgave her. Okay that sounds horrible, don’t get me wrong, I love my mother. But after that I was always hesitant to put my trust in her baking, especially after a few years later when she tried to make me cookies. But that’s another story. Watch out, Courtney couldn’t even wait till they were out of the oven! While these brownies are super chocolaty and quite possibly the best brownies ever, I have to warn you – the batter is better. 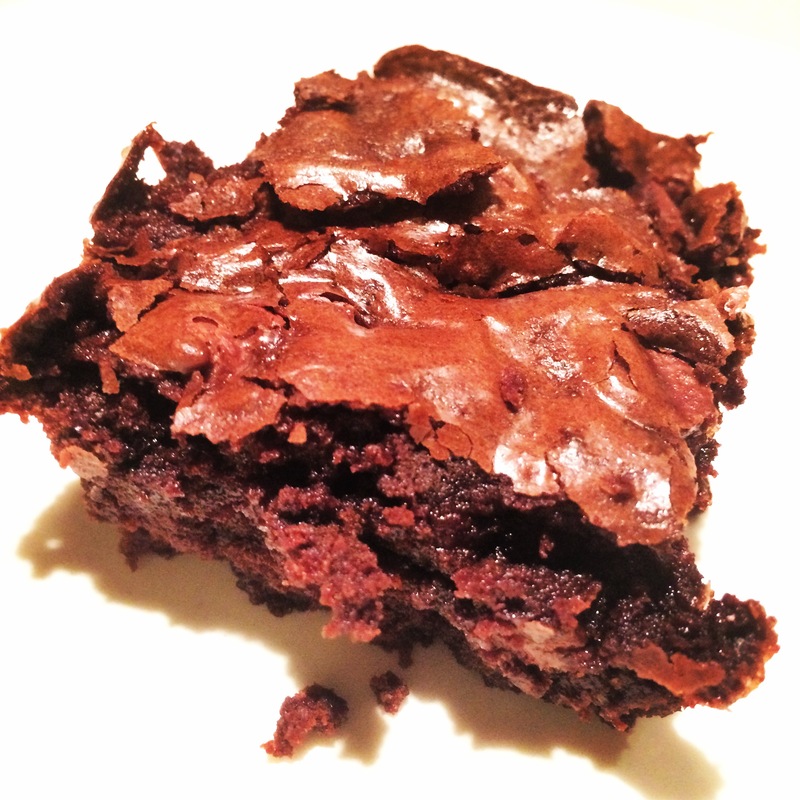 If you can muster up the courage to actually eat the brownies you will not be disappointed. 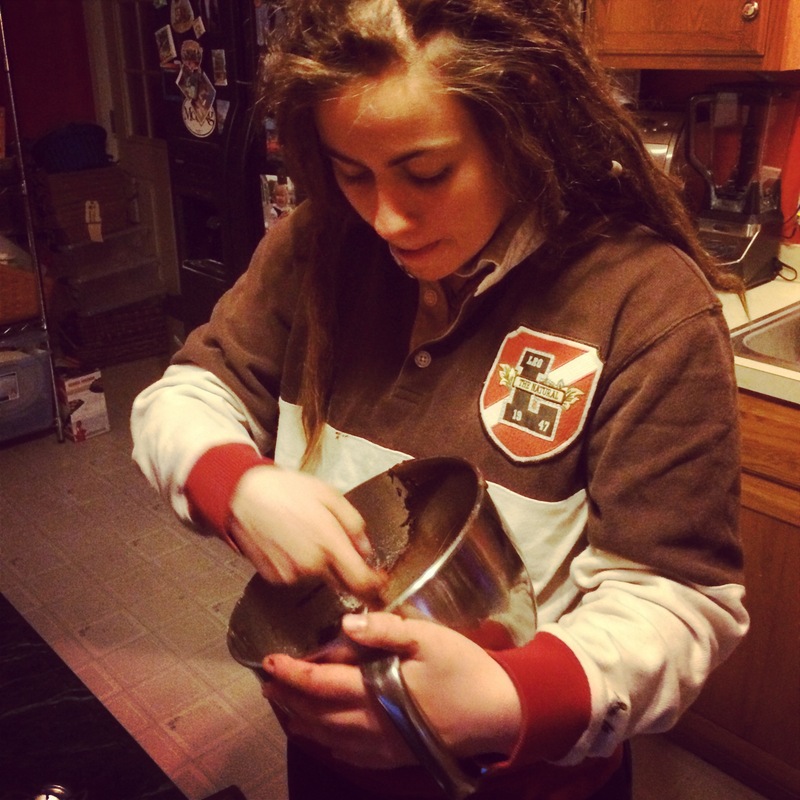 Combine cocoa and baking soda, mix in 1/3 cup of melted butter and boiling water, mix until combined. Stir in sugar and remaining butter. Add flour, vanilla, and salt, and chocolate chips. Mix well. Pour into a greased 9×13 pan, bake for 35-40 minutes.